Company | BMG Group Inc. The mission of BMG Group Inc. (BMG) is to be the global leader in providing secure, cost-effective and transparent ways to purchase and store physical gold, silver and platinum bullion for real wealth preservation and true portfolio diversification. BMG’s 16-year history of ethical management and compliance is achieved in partnership with the industry’s most trusted business entities including, among others, our custodian, The Bank of Nova Scotia, and our auditors, BDO Canada LLP. BMG is also regulated by the Ontario Securities Commission (OSC) which monitors compliance with the requirements of the Securities Act (Ontario), as well as with any related rules and policies of the OSC. BMG was the first precious metals bullion management company in Canada to become an Associate Member of the London Bullion Market Association (LBMA). This validation and endorsement is only bestowed upon firms that meet the LBMA’s rigorous industry standards on refining, reliable trading and Good Delivery practices. All refiners producing Good Delivery gold bars comply with the LBMA Responsible Gold Guidance. The Guidance aims at combating systematic or widespread abuses of human rights and avoiding contribution to conflict, while requiring refiners to comply with high standards of anti-money laundering and combating terrorist financing activities. Legend has it that gryphons, driven by instinct to seek out treasure, roamed the Caucasus Mountains in search of gold and precious stones. They would dig up these riches with their powerful talons and build their nests of gold. The gryphons were ever vigilant, protecting their nests and keeping thieves away, thus developing a reputation for being the guardians of gold. Legends about this mythical creature with the head, talons and wings of an eagle and the body of a lion date back to 3,300 BC, when a gryphon was chosen as companion to the Egyptian Pharaoh. 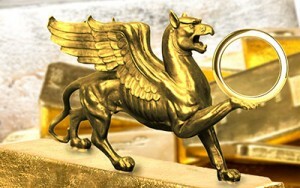 Known for centuries as a symbol of strength and vigilance, today the gryphon embodies the spirit of BMG. BullionBuzz is a weekly eNewsletter that offers investors a quick snapshot of must-read news pertaining to the markets and precious metals.